DiscoLights is an amazing free disco lights software for PC. Lightweight and easy to use, DiscoLights is sure to make the music listening experience on your computer a lot more fun. It basically displays a chain of seven different colored circular rhythmic lights, that flash in sync with your music. DiscoLights thus brings the hugely popular light organs of the seventies to your desktop. It can visualize any valid audio source (microphone, speakers, line-in etc.). The chain of lights can be moved around and placed anywhere on the desktop. You can also change the size of the lights. Heck, you can even change their orientation from the default horizontal to vertical. Oh, and did I mention that it’s available as a portable application? Bet you’re getting all psyched to jazz up that desktop of yours, aren’t you? Then let’s head past the break to find out more. Pretty simple, don’t you think? That’s all there is to DiscoLights’ interface. When you start up the application, an information box pops up, letting you know of the detected audio source (currently audio output device of the computer) that DiscoLights will respond to. As illustrated by the above screenshot, all you have to do to change the audio source is right click on one of the lights and change it. 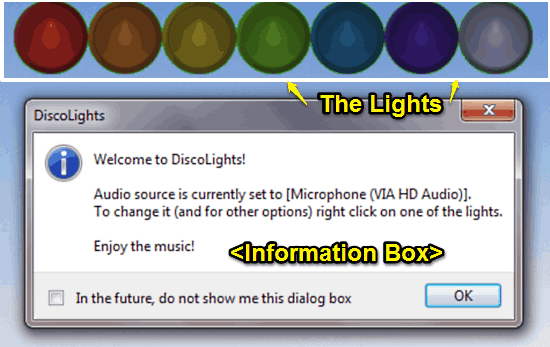 By default, this information box is displayed every time you start DiscoLights. However, you can use a simple checkbox at the bottom to make it go away. As simple as that! 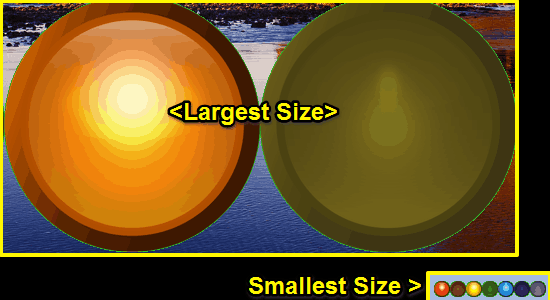 Size: Lets you change the size of the lights. Sizes vary from Small (16) to Large (256). Source: This option lets you change the audio output source. Always on Top: Select this to make those flashing lights always stay visible, no matter what. Horizontal: Deselect this option to toggle the orientation of the lights from horizontal to vertical. Enabled: Enable/Disable the lights via a simple click. How To Use This Free Disco Lights Software For PC? Using DiscoLights to have fun with your music is really easy. In most cases, the application automatically detects the audio output source and starts working. Here’s little step by step process anyway. Step 1: Using the Source option on the context menu, select the audio output source (microphone, speakers etc.) if it’s not already selected. Step 3: Once you’ve selected the size, simply fire up your music player and start playing some music. Once you do that, you’ll see your DiscoLights flash rhythmically to the currently playing music’s tune. You can change the size, orientation and position of the lights on the fly, while the music is being played. How cool is that? DiscoLights is an amazingly fun free disco lights software for PC. It’s simple, lightweight and works great with all kinds of audio sources. Features like variable size of lights, with options to change orientation, enable/disable them via one click are really great. Give DiscoLights a try, and turn your desktop into your very own discotheque.